Former History teacher makes history! Former Head of History at St. Ambrose College, Derrick Murphy has hit a landmark with the publication of his 65th book and reaching the half million mark in global sales with his first book published 20 years ago! Derrick has also served as editor and a regular contributor to the ‘ Modern History Review’ magazine and other magazines such as ‘History’. In all he had over 40 articles published. The latest book is entitled ‘The Changing Nature of Warfare’. Derrick said, “I have written on a wide variety of topics from late Medieval Spain to 21st Century Britain. I have also had the pleasure of commissioning and editing work by a wide variety of historians. I wrote and edited a history of Britain from 1914 to 2000 which involved some of the top historians working in their fields at the University of London, including those who had the privilege to study the recently opened files in the old Soviet Union, now Russia, on their aspect of the Cold War. My favourite area for writing history is on American Civil Rights. I was brought up in the 1960s and was a great admirer of Dr Martin Luther King and the struggle for Black Civil Rights. 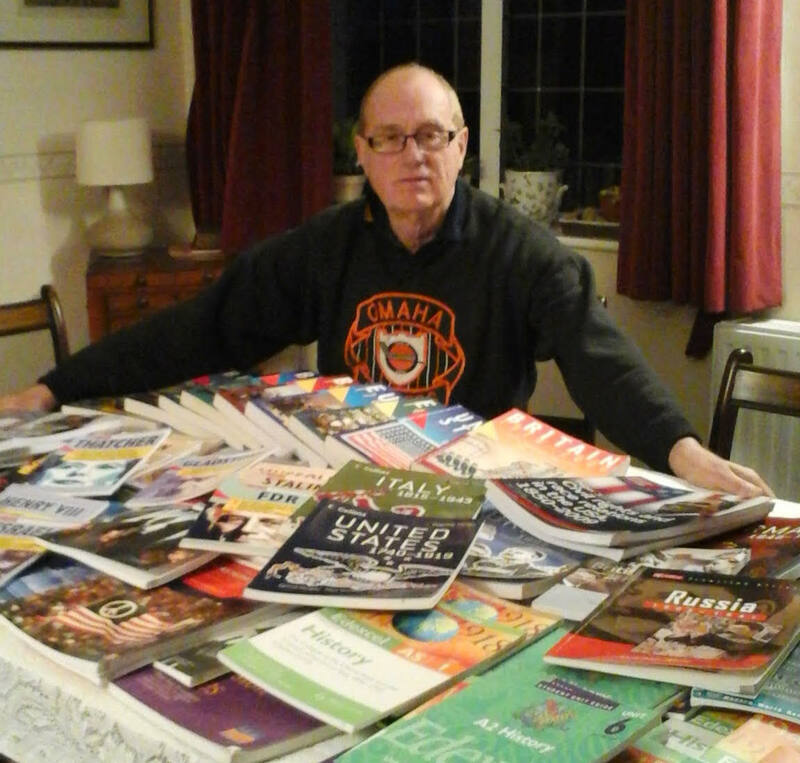 Through the good offices of my publishers my books have been sold worldwide. When Derrick ran the History Department at the College, we were awarded the Royal Historical Society prize for the best A level results in UK twice and runner up once, which is still a unique achievement for any school/college. On behalf of us all, congratulations Derrick! Since our inception in 1996, the SAOBA AGM has always been an opportunity to reflect on the events of the previous year and start to plan the activities of the forthcoming year. All members of SAOBA are entitled to attend the Association’s AGM. It is an ideal time to ask questions of SAOBA, and perhaps become involved with the Committee. Any vacancies for officers of the Committee can be filled at the AGM, and elections and re-elections can also take place at this time. Our forthcoming AGM will be held on the evening of 7th January 2019 in Hale, venue to be confirmed (depending on numbers attending). If you would like to attend the AGM please email committee@saoba.org as soon as you can, and we will send you further details in good time. Thank you for your help. 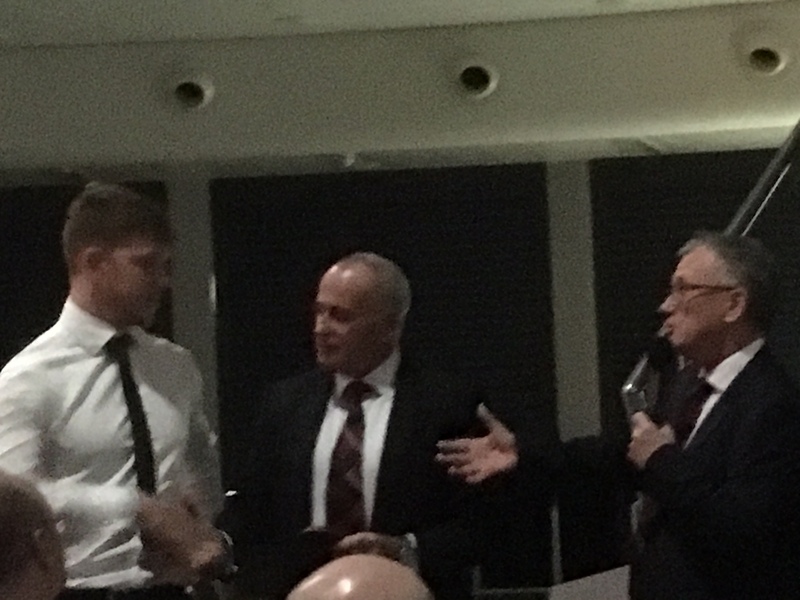 Peter Riley our outstanding MC for the 19th time, opened proceedings and introduced the Old Boys to Mr Dermot Rainey, Acting Headmaster of St Ambrose College. We had the customary opening game of Heads and Tails, won by Mr Mark Elwell who very generously donated back the £50 cash prize to rapturous applause. George Tsiantar kindly said Grace before the meal in fluent Greek, another first for the Old Boys Association. Bernard Stafford was in his element, and as soon as the starters were served, he began selling the ties to the newly attending Class of 2018, spurred on by his recent stock take. Despite the uncertainty over Brexit, SAOBA tie prices have remained rock steady, with the same world-class offer of “one for £15, two for £30”. Have SAOBA ties outperformed Sterling? Yes it was a smaller, all-male dinner, so it was open season for risqué jokes… “B.. has been working as a flasher in Heaton Park; he was thinking about retirement, but after some consideration, he’s, decided to stick it out for just one more year”. 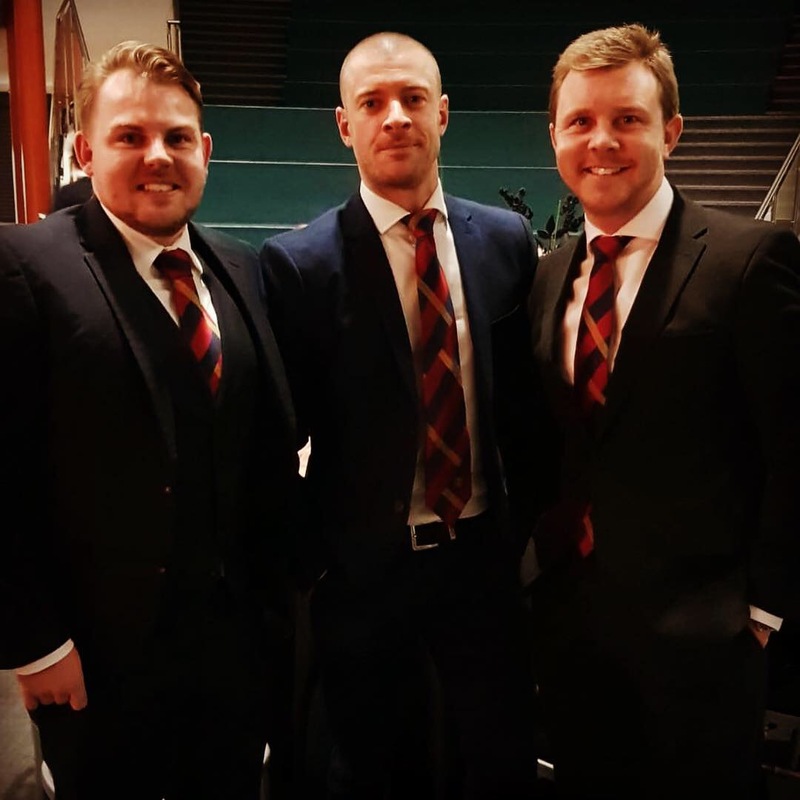 After that Mark Payne and Nick Payne, both business-minded men, managed to negotiate Bernard down to an amazing and unrepeatable offer of 2 ties for £40, to general gasps of amazement. After our delicious Lamb Shank main course and Chocolate and Berries dessert, tea and coffee were served and we were ready for the main event of the evening. 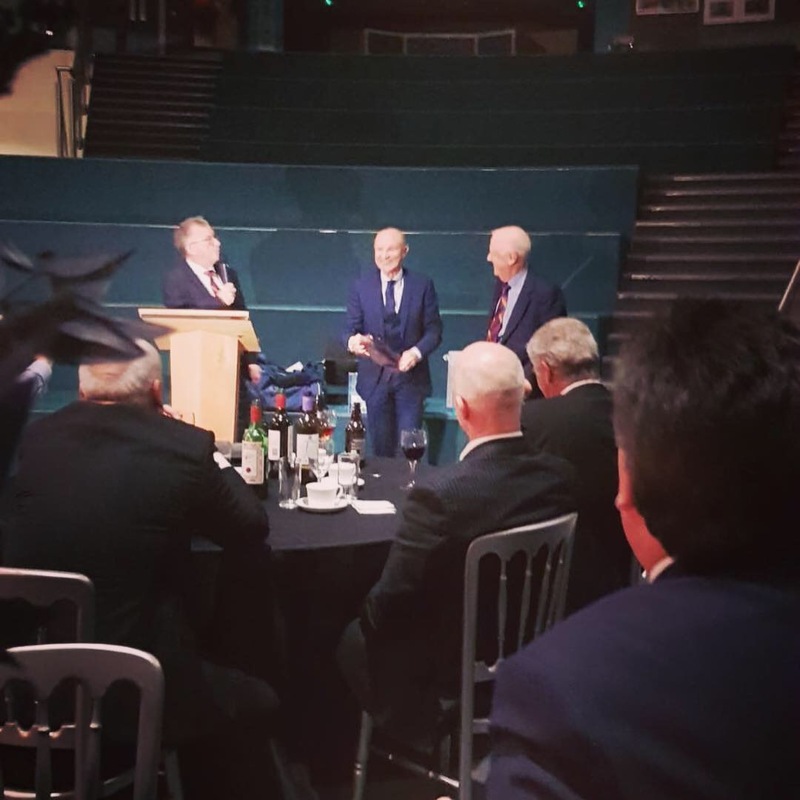 We were delighted and honoured that Manchester City and England football legend Dennis Tueart was able to join us to speak at our 23rd SAOBA dinner. Dennis gave a thoughtful and entertaining account of his personal journey through his remarkable career in football. He described growing up in Newcastle, signing for arch-rivals Sunderland and winning the 1973 FA Cup, then moving on to Manchester City. During his time with City he scored the unforgettable winning goal of the 1976 League Cup final at Wembley with one of his trademark overhead kicks. He later described this as the goal of his career. Dennis turned down approaches from both Manchester United and Nottingham Forest, choosing to move to the USA to play for the New York Cosmos. In New York he replaced Pele himself, and played alongside Franz Beckenbauer and a host of international stars. After four glamorous years in the US and touring with the Cosmos he returned to play for Malcolm Allison’s Manchester City, and to settle and start a family (where his sons attended St Ambrose College). He went on to become a director at Manchester City. Dennis very kindly took questions from the floor and signed copies of his book, “My Football Journey”. Peter Riley revealed that he had been there at Wembley for the Dennis’s 1976 League Cup final against Newcastle, and had kept his programme, signed by the winning Manchester City team, in perfect condition for over 40 years. Very generously he presented this to Tony Dixon, the long-serving SAOBA Secretary, in return for a 2 year renewable contract and this was graciously accepted. Felix Egan from the class of 2018 drew the raffle, the Amazon Echo was won by Mr Mark Elwell – his second big win of the night, so he decided to keep the prize this time, and incredibly the Bottle of Champagne was won by Felix himself (Can you win your own raffle? – the consensus from the floor said “yes”), and John Tueart, fresh from rehearsals of “Little House on the Prairie”, and one of those few in the room without a tie, won the SAOBA Peter Saville designed tie. The Ringway Golf Club 4-ball prize (courtesy of ex Captain of the Ringway Club, Mr Peter Fitzpatrick) was won by Anthony Potts. 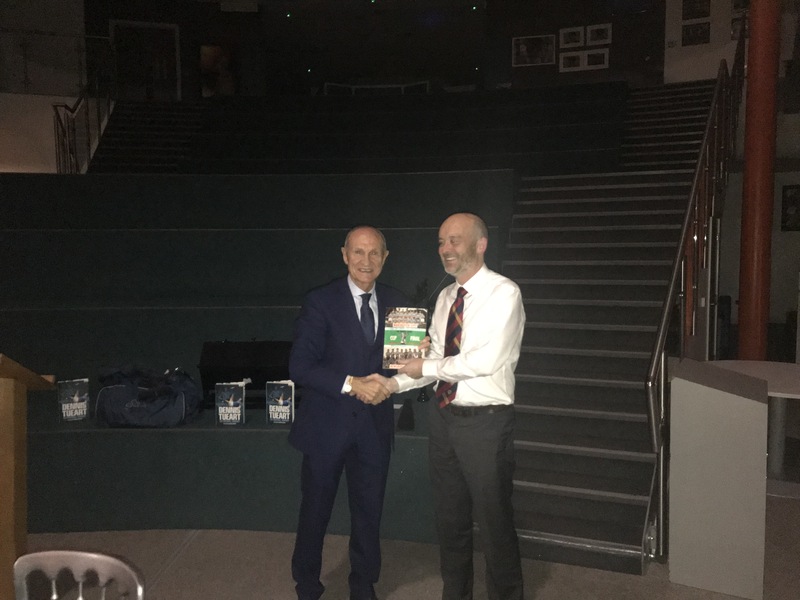 Peter Riley presented the awards for the 2018 SAOBA Golf and Cycling events, to Dave Wilkinson and Mike O’Kell respectively, accepted on their behalf by Mark Gallimore and Ciaran Booth. Both fine rugby players, Mark (St Ambrose class of 1978 and Altrincham Kersal RUFC) and Ciaran (St Ambrose class of 2018 and now with Sale Sharks) were compared as an example of rugby player inflation over the past 40 years. Both of these gentlemen had the honour of being 1st XV rugby captain during their time at the school. Bringing matters towards conclusion, Adam Mitcheson made a sincere Chairman’s speech and explained our £250 cheque presentation to the CALM charity (Campaign Against Living Miserably) aiming to reduce the terrible toll of male suicide. This has been the charity focus of this year’s dinner. Adam went on to describe the strength and potential of the St Ambrose network with the utility of its connections from the school to a range of fields in the wider world. And all too soon, our time was up for another year. Peter Riley closed the dinner to applause, and the assembled gathering said their goodbyes and departed to their carriages home or some to the bright lights of Hale and the Goose Green area of Altrincham. We look forward to seeing you at the 2019 dinner. Inaugural SAOBA Cycle Event a great success! On a clear but chilly morning on Sunday 7th October a hardy band of determined SAOBA cyclists assembled in the old Prep School Car Park (“where have the bike sheds gone?”) ready for the first official SAOBA day ride. Some had cycled from home, and Mike O’Kell had cycled the furthest (16 miles to Hale Barns). But he didn’t complain as he was still freshly trained from his recent mammoth Lands End to John O Groats cycle ride! The day’s route took us from Holy Angels church, down Wicker Lane, following the former St Ambrose cross country route, down to Bankhall Lane, and then over the railway bridge to Ashley, through Mobberley and south into Cheshire, all the time keeping to the quietest, smallest roads. It was a fine morning and there were plenty of cyclists out. We arrived at the Jodrell Bank big dish cafe in under an hour. We were able to learn about the origins of the universe over 14.8 billion years ago, and catch up over coffee and a bacon and sausage barm. The slightly extended return route took in Goostrey, Peover, Plumley, Knutsford with a brief refreshment stop by Tatton Hall, before we waved goodbye to Mike at the Rostherne gate, as he headed back to Northwich, and the rest of the group took the Tatton mile home, completing the 33 mile course. Simon Harrop and I were asked to pick a 2018 SAOBA cycling champion from the group. It wasn’t an easy choice, as it was never a race. We decided that the only way to distinguish individuals was by their mileage on the day. As Mike O’Kell had clocked up a total of 58 miles, he has been confirmed as our Inaugural 2018 SAOBA Cycling Champion. Simon Harrop is second and Ian Taylor in third place. All three are excellent cyclists. The day was great fun and who knows, it might even happen again in 2019! The Annual St Ambrose Old Boys Golf Day was held this year on Friday the 12th October at the Wilmslow Golf Club. The heavy overnight rain did little to dampen the enthusiasm of the hardy band of golfers participating in this flagship event. As lunch was being taken the rain decided to come down even heavier but a quick check in the Professionals’ shop on the weather map gave the necessary reassurances that conditions would improve during the afternoon and at 13.54 George Tsiantar hit the first ball and the competition was well and truly underway. The standard of golf played in the afternoon was high and despite the gusty winds it was more the gutsy performance of the players that carried the event. After 18 holes of golf the players retired to the local pub – we’d been out so long the clubhouse had stopped serving food by the time we returned to its comfort – and after a hearty meal and some liquid refreshments the winner was announced by Peter Riley. There was a card play off to decide the 2nd and 3rd place but on his Back 9 score George Tsiantar with 33pts was declared the runner up, with Mike Budd coming a very creditable 3rd. However, there was a clear winner on the day and congratulations to David Wilkinson with an excellent score of 37pts he became the 2018 Champion Golfer following an excellent display throughout the afternoon. Next year’s event will be held on the 2nd Friday in October again. With High Legh, Warrington, Dunham Forest, Mere and Wilmslow all throwing their hat into the ring in the hope of being selected as the course to be chosen in 2019 – watch this space as they say for further announcements!